Abstract: An analysis of the gravity field in the Western and Eastern Carpathian junction area is based on local isostasy and forward density modelling. For the first time the lithosphere/asthenosphere boundary was taken into account for density modelling of long-wavelength gravity anomalies in this region. The gravity effects of the main geological structures within the lithosphere were estimated. To give a better view of the present lithosphere structure in this region, density cross sections were calculated along the Profile KP-X. The results demonstrate a slab-like structure under the mountain range. The slope of the underthrusted lower European Platform is very steep. Modelled slab dips from about 60° to 80°. Density modelling shows that the southern margin of the European basement bends down to the soutwest into the Carpathian subduction system. The East Slovak Basin is characterized by thinning of the crust and lithosphere. The extension process is accompained by the existence of lower crustal high-density mass. Abstract: The Cirocha, Trangoska and Zazriva fault zones have dominant structures developed during the transtensional strike-slip stage of their movement histories. It is indicated by the negative flower structure on the cross-cutting reflection seismic profile and the calculated paleostress pattern from one of the three stress patterns in the case of the Zazriva fault zone. Rotated paleocurrent sets in undefined blocks indicate the existence of flats somewhere in depht accommodating the separate block movements in the dextral strike-slip system.The most prominent structures of the Trangoska fault zone, large shear planes with striation having a significant divergent dip-slip component, were also developed during the transtensional strike-slip reactivation. It is indicated by the slickenside lineations. This sinistral reactivation did not develope shallow flats, as shown by the lack of rotations. The Cirocha fault zone acted as a dextral transtensional strike-slip during its activity. This is indicated by the calculated paleostress pattern which did not undergo significant changes. Presence of the flat at about 2.5–3 km depth is constrained by the reconstruction of the 3 km wide and 10 km long Velka Polana flake. This flake dextrally rotated about 90°, as indicated by the rotation of Cretaceous, Eocene and Oligocene paleocurrent patterns and paleostress patterns. This rotation was not accommodated by the formation of new faults inside the flake. These observations are compared with the shear stress/reactivation modelling. The presence of the very low friction flake boundaries would explain the fact that no new faults were formed until the flake rotated about 90°. The flat underneath the flake was developed along the flat of the pre-existing thrust fault. Abstract: The Brachiopod "Spirigera" deslongchampsi Suess has so far been known only in the Northern Calcareous Alps. It is the first find of this fossil on the Western Carpathians. The brachiopod belongs to the family Spirigerellidae Grunt 1965 (sensu Dagys 1974) and it is most probably a new genus. It is a very rarely occurring fossil (only a very few speciments were found altogether) so its generic identification for the time being remains doubtful. According to macro and mainly micro fossils the pebble material is of the Early Rhaetian age. We assume that it derives from a transitional type between Hallstatt Limestones and Zlambach Beds facies. Abstract: The organic linings of minute foraminifers can be naturally stained by Fe-oxides during early diagenesis. This protects them against destruction and make them visible in thin sections. Up till now the microforaminiferal linings were described only from extractions for palynological investigation. A set of morphotypes of the foraminiferal linings from thin sections of Callovian-Oxfordian limestones and Lower Cretaceous cherts is illustrated with comments. The morphological aspects of the foraminiferal linings allow us to associate them into morphogroups and form genera. Some of well-developed linings are sufficient for their generic as well as subgeneric classification enclosing more than 30 foraminiferal taxa. The reasons for the organic-walled structure of “microforaminifers“ are inferred in environmental stress or dissolution of rigid tests after death. The possibility of using some linings in foraminiferal stratigraphy is discussed. 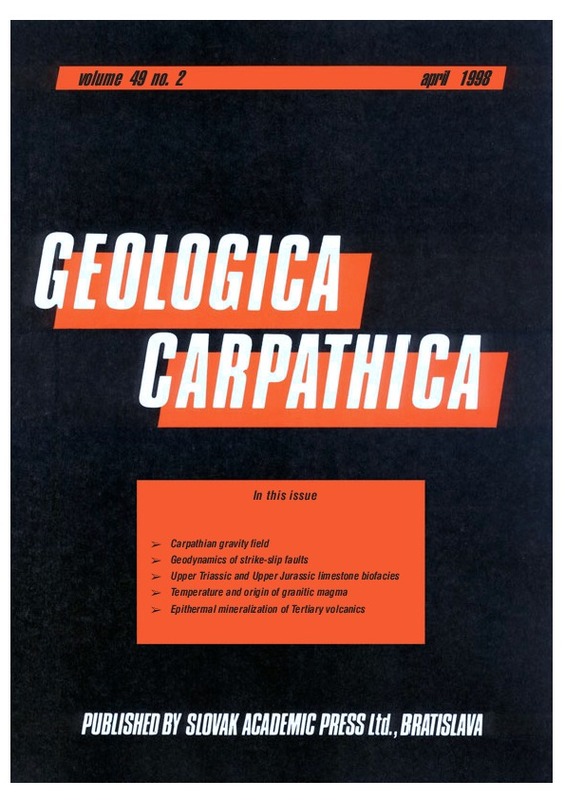 Abstract: Two boreholes in the Mo-W-bearing porphyric Cretaceous granite, located near the village of Rochovce, Western Carpathians, reveal the existence of two types of enclaves: 1. micaceous enclaves (biotite-plagioclase gneisses without quartz, with highly calcitic plagioclases) and 2. mafic microgranular enclaves (MME), with predominantly dioritic composition. In the first type, corundum, Zn-hercynite and magnetite were produced due to the high temperature melting of biotite. These are considered to be restites. The melting reactions in biotite indicate that the granite magma temperatures exceeded 800 °C at the time of the enclave melting. The mafic microgranular enclaves represent portions of mafic magma incorporated in the granitic magma. Seven types of mineralogical-petrological indicators of magma mixing were found. The chemical and Sm/Nd isotopic characteristics of the host granite and MME show that chemical and isotopic equilibration was achieved within the granite-MME system. The initial ∈Nd value in granite (-3.0) indicates that some mafic magmatic material was added to the magma chamber. The apparent crustal residence age (T*DM = 1100 Ma) indicates an old, Precambrian history of the crustal source material. Thus, the Rochovce magma was derived from a crustal source, with addition of more mafic (probably mantle-derived) magma. Abstract: The abandoned Roztoky silver - base metal deposit represents a scarce example of Tertiary sulphide vein-type mineralization spatially and genetically associated with intraplate volcanic rocks of the Cenozoic West and Central European Volcanic Province. The deposit is situated in the Tertiary Roztoky Volcanic Centre (RVC) of the Ceske stredohori Mts., within the Ohre (Eger) Rift. The main ore vein parallels an older bostonite dyke intersecting the monzodiorite body, however, both are intersected by a younger trachyte dike. This suggests that the origin of the mineralization is related to the development of the RVC. The δ13C values of vein carbonates indicate the influence of deep-seated CO2 but the O isotopic composition of hydrothermal fluids (calculated δ18Ofluid values from -3 to -7 ‰ SMOW) shows the dominance of water with relatively shallow circulation. Sphalerite-galena sulphur isotopic geothermometry yielded temperatures between 200 and 250 °C and the presence of cubic hessite indicates temperatures above 155 °C. The calculated δ34Sfluid values vary in the range -1.0 to -2.0 ‰. The presence of banded "colloform" sphalerite and chalcedony suggests lower temperatures. High lead isotope ratios of galena (206Pb/204Pb about 19.03, 207Pb/204Pb about 15.67, 208Pb/204Pb about 39.17) can be a result of mobilization of lead either from Tertiary magmatic rocks, which show similar lead isotope ratios and were probably derived from a sublithospheric HIMU mantle plume, or from upper-crustal rocks, e.g. local Upper Cretaceous sediments. The 87Sr/86Sr isotope ratios of the principal hydrothermal carbonates rhodochrosite (0.70524) and calcite-dolomite (0.70510) are higher than both the local primitive magma derivatives and even the developed rocks of the RVC and indicate an admixture of Sr derived from local crustal rocks.The volcanic rocks of the RVC were the dominant heat source during the formation of the ore deposit. The hydrothermal deposit was formed during relatively shallow hydrothermal circulation of low to medium salinity, low-δ18O fluids supported by CO2 influx of deep-seated origin.